- Cats Mimi (found at the doorstep), Belle (who we took in for a friend) and Dandelion (who we found on CraigsList), and now new foster kitty Tiger Lily, already settling in. After a class in hardwood floor finishing tonight (oh, the glamour! ), I got to head off to the launch party for Belly Up! What is Belly Up, you may ask? It's an awesome new cocktail and craft beer membership program that allows you either 25 craft cocktails, 25 beers — or both! — at a variety of local bars and restaurants. You know, the kind of places you already either go to or want to go to, like Nighthawks, Tongue in Cheek, Borough, OxCart, or Heyday (where the event was tonight). They also have variety of social events. Price point starts at $25 and goes no higher than $85 for the year (25 beers, 25 cocktails, 4 pint glasses and 4 cocktail glasses). If you buy the "full" membership you even get a set of charmingly designed beer and/or highball glasses created by local artists, though let's be real, if I have access to a whole bunch of great craft cocktails, I'm far less likely to be drinking in front of Netflix at home. I wear the Minnesota necklace that my friend Sommer got me almost every day. I often get compliments on it, and I say I wear it because I am too chicken to get a tattoo. I guess I can't say that anymore. Last week, my friend Nora came up with an idea. Like many I know, she had been turning over Mitch McConnell's words about removing Elizabeth Warren from Senate chambers in her head — "She was warned. She was given an explanation. Nevertheless, she persisted." And, I think like me, the ultimate irony was that, in meaning to demean Warren, those words gave her so much strength. Words have so very much power. So, though in her words "I never thought I would get a quote from Mitch McConnell put on my body," she kept on thinking of it as a tattoo. And then she created an event for some of her friends. Wouldn't it be cool if several of her friends headed out and got the same tattoo together, and donated the proceeds to Women Winning? On a day when out local JCC was closed due to a bomb threat, it seemed even more fitting that tonight we went to see Fiddler on the Roof by Ten Thousand Things Theater. It was one of their free many performances, which they hold to make sure that their shows are accessible to literally all. This one was at the American Indian Center, which I had never been to. Beatrix is used to going to shows in all kinds of places, but I don't think it had ever occurred to you that you could do theatre like that in a big community space, so she was particularly fascinated. The downside of the recent warm weather is that so many of the fun winter things to do are — very quickly — literally melting away! So we took advantage of the Ice Castles in Stillwater being open tonight for a Valentine's Day outing. We've wanted to go for a few years, but this is the first time we got it together to do so. And I'm really glad we did! We got there just as it was getting dark, and it was pretty quiet. The warmth meant the ice had a slight mist to it. The castle looks pretty small from the outside, and we enjoyed the twisting caverns as we walked in, and the colored lights just showing up against the ice as it got dimmer. 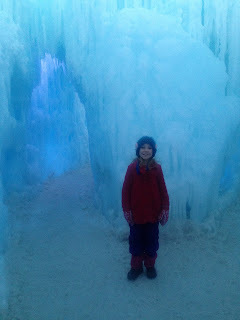 It felt a lot like a British Christmas grotto, but made of ice. So when you own three houses, what do you do in your free time? Head to someone else's house to take a class in painting a room! The Preservation Alliance of Minnesota has a fantastic series of classes, and the one Patrick and I took yesterday was on paint and plaster techniques. We were working on a little 1885 worker's house in South Minneapolis — a smallish dining room with high ceilings, a simple stained glass window, and an all-white starting canvas. Anders Christensen, of TigerOx Painting, was the instructor, which was great for two reasons: 1) I have known him through preservation circles for a long time and find him one of the smartest, most lives-to-his-values people I know, and 2) he's an incredible painter. I'm a pretty good painter, but I was really excited to "brush" my painting techniques (as it were). It was a week about looking back fifty to sixty years, with a particular eye towards race and prejudice — which, if you think about it, is not all that different than waking up every day right now in the current political climate. It started when Patrick and I watched Loving, which had been on our must-see list for a long time but was blink-and-you-miss-it in theaters. It's the story of Loving vs. the State of Virginia, the Supreme Court decision that finally allowed interracial marriage — and I'll remind you that, though the Lovings married in 1958, the court decision was not until 1967. It's a movie that, obviously, has a lot of meaning to Patrick and me; just think a minute, if you haven't, about what it would be like within your lifetime, to not be able to be married to the person you love. A lot of you reading this know very personally how that feels, but if you've never thought about it, it's worth considering what a privilege it is. One of my favorite niche genres ton read lately has been foodie books. I recently enjoyed A Proper Drink, so thought The Underground Culinary Tour would be fun. It was more than that. I was smitten. The author, Damian Mogavero, has developed a sophisticated data analysis system that analyzes POS systems in restaurants to look at trends and increase sales. His examples, from hotshot Vegas places to a Long Island favorite, are fascinating, as is the way he can project those trends to nationwide chains. Most particularly, it brings back the importance of service to a foodie culture; it's not (just) about the top chefs, but about the guest experience — something a lot of places could learn from, and that my favorite restaurants know well.